Remember your own career and plan and act accordingly! With the end of the year fast approaching, it’s a good time to consider your career and professional development so you can begin the new year with renewed vigor. Where are you headed? Do you know? 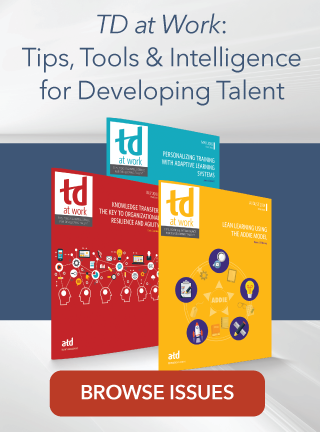 As talent development professionals, we too often spend all our energy and resources on others’ professional development. It’s easy to forget about brushing up on our own skills or probing a new career field or angle in our existing one. But where do you start with . . . you? It's natural to want to see some evidence of accomplishment, whether in the form of a certification, license, endorsement, certificate program, or recertification. Each of these has its own requirements, and the rationale for pursuing one over the other varies. For a professional certification to best meet your needs, it should be based on skills and competencies that will help you improve your work performance immediately. As well, you should consider what your company needs. Will your employer aid in that development? Alternatively, are there clients you’re missing out on due to lack of skills or competencies? One way to find out more about what skills are in demand or may be required in the future is to review a competency model. You may decide that you need to have all the skills included in the model, or you can focus on only one or two areas. Earning a certification is, of course, only part of the career picture. It should be a subset of your larger, SMART goals—goals that are specific, measurable, attainable, relevant, and time-bound. But your larger view is necessary to select which, if any, certification is appropriate for you. There are several things to consider and steps to follow once you make a decision to pursue a specific certification. Eligibility. Hopefully, you have already verified that you are eligible for the certification. If not, make sure to check out all the requirements. Cost, in terms of time. Are you ready to devote the required amount of time to work toward this certification? What would you have to give up as part of your daily routine? Factor in not only class time, but study time as well. Work backward from when you intend to take the certification exam to determine how much time you need each week to study. Is this schedule feasible? Cost, in terms of money. Does it make sense for you to join the affiliated organization before enlisting in the certification course? How will you finance your efforts? Will your employer help, with either association membership fees or time associated with obtaining the certificate? Final steps include making a concrete schedule to prepare; studying, studying, studying; and taking the exam. What are the benefits of all your efforts? Increased earning potential, a certificate that will serve as a differentiator among other job candidates, an upgrade to your skills and knowledge, and—perhaps most important—the personal satisfaction you will receive from earning the certification. So, is a certification in the cards for you in the coming year?